Looking across from our docked ferry boat into the blue waters of Lamon Bay we were getting a bit anxious. Dark rain clouds over the horizon and the constant trickle of rain against the boat’s protective canvas sheet seemed like an ominous sign for a 3-day vacation turned into a minor disaster. But it was too late to turn back now. Within minutes it seemed that our worse fears were about to be realized when the boat we were riding was soon bucking against the waves. And then, just as we were nearing our island destination the skies gradually began to clear, revealing hues of blue sky amidst mushrooms of white cumulus clouds. Cagbalete Island finally! Our sea cab parked at Sabang or the port of Cagbalete during our first trip. Three years later a resort was built on the northern part of this beach. 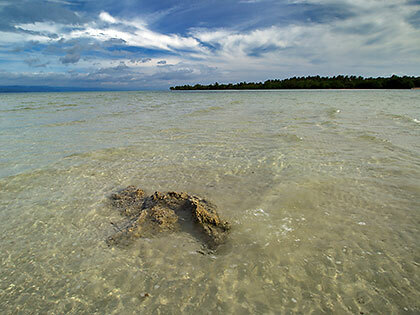 Cagbalete is part of the municipality of Mauban in Quezon Province with Lamon Bay separating it from the mainland. We have known about its location for a few years before we first set foot upon it in 2013. We would return to the island again three years later. Both these trips were done during the off-peak tourist season, in the months of January and August when the weather normally wasn't very cooperative. On both occasions though, we were fortunate to have relatively sunny weather despite a little roughing it out with the waves during our initial visit. 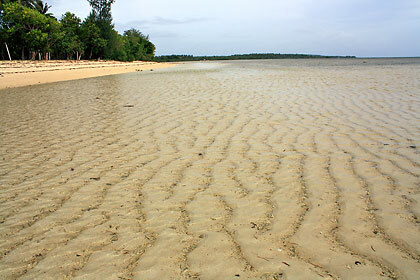 The Yang-In Sandbar at low tide in the western part of Cagbalete. During our first visit we got to meet Rose, a Department of Tourism volunteer in Cagbalete who met us as we disembarked at Cagbalete’s Sabang port. Rose had her mom prepare a nice but inexpensive lunch for us before accompanying us as we trekked to our resort: Villa Cleofas located on the opposite or eastern side of the island. Three years later Rose would accompany us again, this time to the newer Doña Choleng Camping Resort on the southeastern part of the island (this time too we rode the resort shuttle instead of hiking the trail to the resort). this time of the year due to the amihan or northeast monsoon. 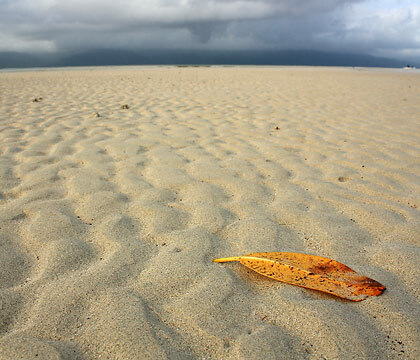 Our main reason for coming to Cagbalete was to view its low tide phenomenon when the sea moves back up to a kilometer from shore exposing a vast seabed of sand with its remarkable ripples. Unfortunately we came in at probably the worst time during our first visit. The resort caretakers told us that the sand doesn’t get fully exposed until full moon when the low tide is at its maximum  and it won’t happen until the week after our stay. It was somewhat disappointing but we made the most of our stay by touring the long stretch of beach on the eastern side. This is where most of the resorts are located. We walked as far as the mouth of a creek with a mangrove swamp  the area right around MVT Santo Nino, a resort north of Villa Cleofas. We soon forgot our disappointment as we enjoyed the fact that we practically had all of the eastern side of Cagbalete to ourselves for the next two days and nights. sand ripples since the waters didn’t completely recede. Strolling along a deserted beach and relaxing under a hammock underneath towering palm trees, we were soon lost in time and space. Cagbalete is home to several species of birds and even just in our resort we would see dozens of sand pipers, a few bright blue-colored kingfishers and the occasional migratory egret. For lunch and dinner we cooked food that we brought with us at Villa Cleofas’ kitchen which was well-equipped to handle our needs. We also grilled freshly caught fish that Rose brought in from the pier. There isn’t much to do at night except sing your heart out at Villa Cleofas’ videoke (which we could do with abandon since we were the only guests). But we were really looking forward to a rest on this trip and we ended up sleeping long hours as a result. 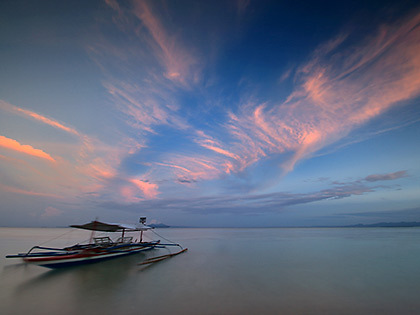 Sunset scene at Doña Choleng Resort; the land mass in the lower background is Alabat Island. Sunsets are best viewed on the western side of the island, at Cagbalete’s pier facing Mauban. Sunrises are what you get when you stay at the resorts on the eastern side. During our recent visit however, we got to stay at Doña Choleng which is located at the southeastern side, enabling us to have good views of both sunrise and sunset. Our rented boat at the Yang-In Sandbar. 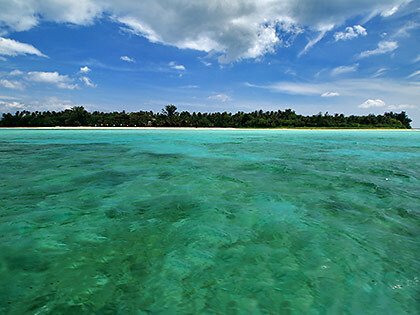 On our first visit to Cagbalete Rose told us that there is another scenic spot  a sandbar on the northwestern side of Cagbalete that was only just becoming known back then. We later confirmed its name: Yang-In Sandbar. Rose rented her boat to take us there and back to Sabang port. According to Rose this was even more beautiful than the sand ripples on the eastern side of the island with the exposed sandbar sometimes stretching out more than a kilometer from shore at the height of low tide. 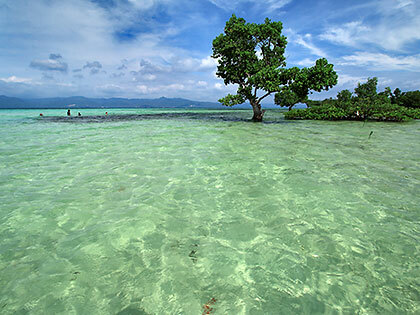 The Yang-In sandbar at Cagbalete’s northwestern side during our first visit. A check with Google Earth later showed that there indeed was a huge stretch of shallow beach projecting from Cagbalete’s northwestern side where Yang-In is located. 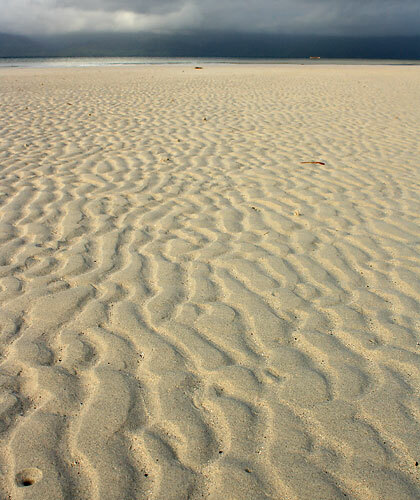 Since it was yet to be full moon we didn’t see the phenomenon Rose was talking about but there was still a good deal of dry beach sand exposed  and with plenty of ripples showing. It was a good compensation after all for missing the sand ripples on the eastern side of the island. Ankle-deep water at the Yang-In sandbar during our second visit. Fast-forward to 2016: We rented one of Roses' boat to take our friends and us to Yang-In Sandbar plus another snorkeling spot on the western side of the island. Excitedly anticipating the same remarkable scenery of completely exposed dry white sand with long ripples we were surprised to see an almost fully submerged sandbar with ankle- to knee-deep water. High tide again, unfortunately, despite the fact that we arrived at almost exactly the same morning hour as we did three years ago. Disappointed, we explored the sandbar up to mangrove trees inland, hoping to make the most of our early-morning trip. Part of the Yang-In Sandbar joins the mouth of a creek that empties into the sea. There is a significant outgrowth of mangrove trees in the area which our boatman said was home to several crabs, fishes and prawns.The first time we went here in 2013 we even spotted solitary egrets foraging for their aquatic meal. teeming with fish, crabs and shrimps. We were about to set off for our next destination feeling somewhat disappointed when Leo spotted a stretch of bright, aquamarine water a bit further up north. To our pleasant surprise the waters at this portion of the sandbar were clean, crystal-clear and waist-deep for the most part. This section of Yang-in had just turned into a vast swimming pool. Succumbing to the temptation of swimming in this vast pool we spent the rest of our morning here and decided to forego our snorkeling destination. This portion of the Yang-In Sandbar turns into a vast swimming pool during high tide. If youre commuting you can take a Mauban-bound bus (JAC Liner) at the Kamias terminal in Cubao or at the Buendia terminal in Pasay (each has 2 morning trips). Travel time is roughly 5 hours. If you miss these trips you can ride any bus going to Lucena then ride a bus or van at the Lucena Grand Terminal to Mauban. Upon arrival at the bus terminal in Mauban take a trike to the port or pantalan where you may catch a ferry or passenger boat to Cagbalete. At the port you need to pay an environmental fee of P50. The passenger boat fee is P70 for visitors as of this writing. 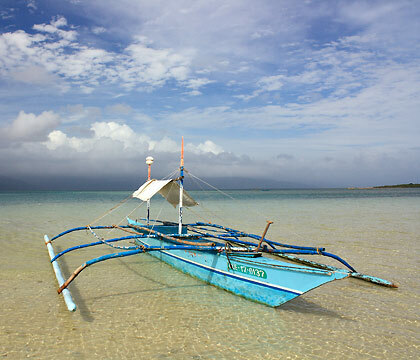 This boat usually leaves for Cagbalete at 10AM and 3:30PM. (Locals say more boats are made available during summer or peak season to accommodate the bigger number of visitors) The boat ride will take anywhere from 45 minutes to an hour. Return trips to Mauban from Cagbalete are at 7:30 PM and 1PM daily. South Luzon Expressway (SLEX) with exit at Sto. Tomas going towards San Pablo, Tiaong, Candelaria and Sariaya. At Sariaya take the road to Tayabas and on to Mauban. SLEX with exit at Calamba. This will take you through Los Los Baños, Sta. Cruz, Pagsanjan, Cavinti, Luisiana, Lucban and Tayabas before going on to Mauban. Take the backdoor route through Antipolo then to the towns of Teresa, Morong, Santa Maria, Famy, Siniloan, Paete, Lumban, Pagsanjan, Cavinti, Luisiana, Lucban, then to Tayabas before finally getting to Mauban. Your choice of route will depend on which part of Metro Manila or any other area you are coming from. We chose the first because we were dropping by relatives in Tiaong. The roads here are also wider and better paved than the other routes. At Mauban there are several enclosed parking areas near the port where you can leave your car for a fee. Our resort has a parking area for their guests very close to the port. 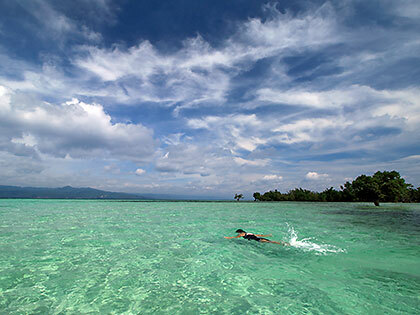 Most resorts are located a kilometer or so from Cagbaletes port. You will either have to walk or hire a small boat to reach your desired resort. Our resort  Doña Choleng Camping Resort  has a shuttle for their guests. Doña Choleng is a relatively new resort, having been open for about 3 years. 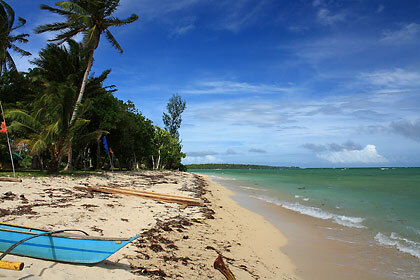 It was actually just being built when we first visited Cagbalete Island. 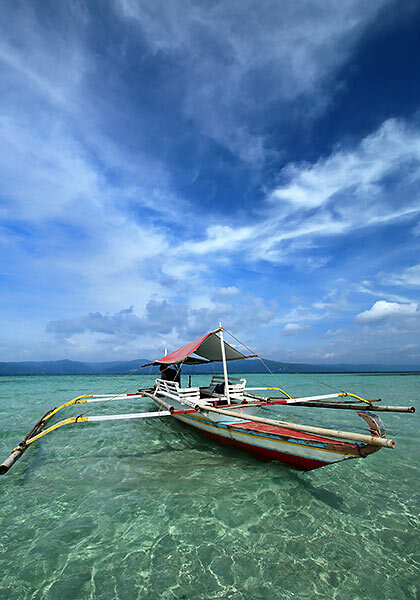 For island-hopping tours and additional assistance we recommend that you get in touch with Rose Coliao at 0910-4518108. Rose has been a very amiable host and even prepared food for us during both our visits to Cagbalete. Normally some resorts will have available food but since we arrived at off-peak seasons and weekdays at that, both of the resorts we stayed at could only provide cooked meals from Friday to Sunday. Rose came to our rescue by shopping around and preparing food for all our meal.